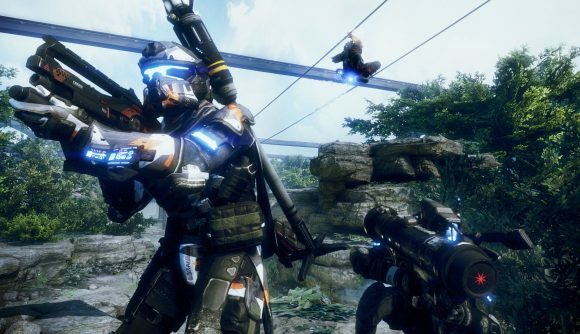 February 4, 2019: The Titanfall battle royale will be unveiled today – and could be available straight away. EA and Respawn will announce a new game later today. Dubbed Apex Legends, the title will be a battle royale game set in the Titanfall universe, and will be revealed in a stream due to take place this evening. That was confirmed by Respawn CEO Vince Zampella, who tweeted early this morning to say “if you like Respawn, our games or even me, you should tune in tomorrow.” The stream will kick off at 08:00 PT (11:00 ET, 16:00 GMT) with a teaser, and the game will be officially announced four hours later (Noon PT, 15:00 ET, 20:00 GMT). There’s some speculation that the game will be available to play immediately after that reveal. For now, at least, we don’t have any concrete information about the game, but multiple reports surfaced over the weekend that may have revealed some details about the game. Apex Legends is said to be a hero-based battle royale, in which players have distinct abilities. Some reports have described it as something of a cross between Rainbow Six Siege and Black Ops 4’s Blackout mode. According to esports consultant Rod Breslau, who goes by @Slasher on Twitter, you’ll be able to play as part of a team of three, with servers supporting up to 60 players. Breslau says his sources describe the game’s free-to-play model as a “similar approach to that in Overwatch,” with microtransactions and loot boxes for in-game cosmetic items. Twitter games blogger Nibel also reports that EA filed for trademarks for the name Apex Legends (and Project Apex) last October, right around the time that EA announced that Respawn would have “multiple games” launching in 2019. Apex Legends is reportedly launching on PC, PlayStation 4, and Xbox One. Apex Legends will presumably feature the high-velocity parkour and traversal that made both Titanfall games so much fun to play – although the titans themselves will apparently be sitting this entry out. You’ll have experienced this kind of action already if you played Titanfall 2’s Pilots vs. Pilots playlist, which was a popular if controversial multiplayer mode. In any case, the rumors all point to this Monday, February 4 for both the announcement and launch of Apex Legends, so we’ll find out how the Titanfall universe works for battle royale, and for a free to play game, very soon.